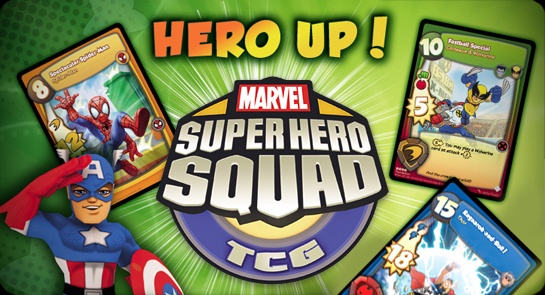 Upper Deck has been trying to do something with the Marvel License for quite some time now since VS. System is no more. They also apparently changed their target gaming audience. While VS. System targeted players of about 16 years or older, I believe this CCG is targeting a much younger audience. The game itself is really simple and well-desgined. You can literally grab 4 boosters per player, shuffle up and then duel! You heard right! This is no exaggeration. No resources/mana (like Magic: The Gathering) and no card restrictions (like color, faction,etc.). There is a maximum number of copies of any card you can pack, 4. It is rather unlikely you get more than 4 of the same card in 4 boosters. Barring some card collation errors on the factory side of things, it’s impossible. Allright, you have your 40 cards. Now what? Now we decide which players starts. Coin clip, Die Roll, Odd or Even card number, etc. Randomly determine who starts the duel. Each Player’s POWER Rating will be 1. At the beginning of each player’s turn, a coin is flipped to check wether or not the Power goes up by 1. It is possible, though unlikely that certain games will end with the power being 5 or lower. However, most games I have played saw the power go up to like 13. So far so good eh? Now we will begin with the different card types. These are your bread and butter in this game. You need these to damage your opponent and win this heroic battle. There is no other card type! Simple enough for ya? While there may not be another card type, there are a lot of things to take into account. For starters, there are 6 different kinds of attacks and they are color-coded even when reference by other cards. There is never really a need to remember the names of these attacks (in fact I only recall a handful). There is only one set so far, so these are true as of that set. One color of attack cannot block against its own color. Basically, each attack has one or more colors it attacks with and one color it blocks. So you can have a red attack that blocks a purple attack but not itself. This obviously prevents lazy deckbuilding , such as just making a mono-blue attack deck. An Attack with 2 or more symbols requires the defender to block with one of each symbol. If you can only block half, you will take the full damage regardless. Sometimes, it maybe not be worth losing a card from your hand for nothing. When taking damage, you flip one card from the top of your deck into your graveyard for each point of damage. This is similar to a now-extinct game called WWE Raw Deal. It’s a great design as it allows you to keep playing without having to keep track of things such as life totals. If you flip a card that can block the attack while taking damage, you will stop taking damage. Now, this is very important. If you think or know that you can block the attack from the top of your deck instead of your hand, you probably want to do that instead of using an actual card from your hand. Again, even if you block it at 2-3 damage instead, it may be worth it. You lose the game when you have no more cards left in your deck AND no more cards left in your hand. This is quite the change from Raw Deal as it allows you to mount a last-ditch blitz to rally and possibly win the game. I have had games go down to 1 card in hand on each side. 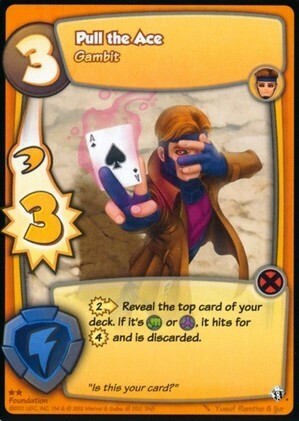 If the active player plays his last card and in turn forces his opponent to use up his last card, the attacker wins. That makes sense right? You want to force aggression. Keepers are like planeswalkers in Magic: The Gathering. 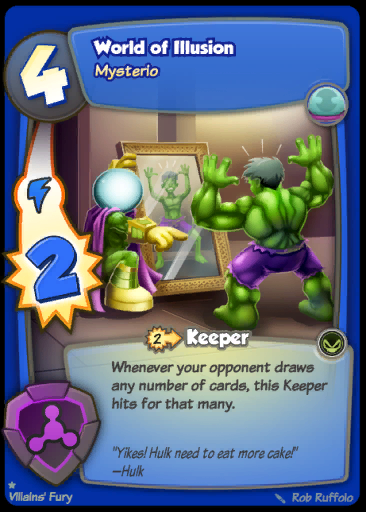 There are cards called keepers that will allow you to produce a bonus/ongoing effect if your attack hit the opponent for a at least 2 damage (sometime more). This will cause the card to stay in play and trigger its effect when the time comes. For example, one of the keepers does something simple like hit your opponent for 1 damage at the beginning of your turn. This damage CAN be blocked and if it is, will cause the keeper to be discarded. Also, flipping a block from your deck while taking damage will cause the keeper to get discarded. the Counterattack ability is not as good as it sounds. 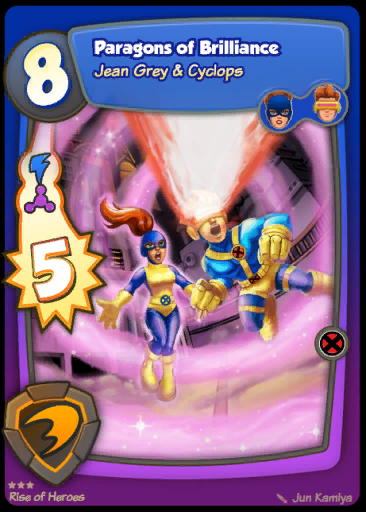 Basically, if the card has the counterattack characteristic, it will deal a small amount of damage to the attacker when you block with it. They are usually attacks that cost more for the amount of damage they can deal as attacks, due to the fact that they can potentially do some defensive damage. Most attacks are really balanced. There are no ‘strictly better’ cards. Even vanilla cards are decent as they have a pretty good damage output compared to attacks that produce effect. This is a rather refreshing change from most CCG’s where you are stuck with filler cards that seemingly have no use except for diversifying the limited format. You are not allowed to check graveyards. This is super important as it wastes a lot of time in any CCG and you don’t want to have younger kids waiting around while their opponents sifts through his graveyard. 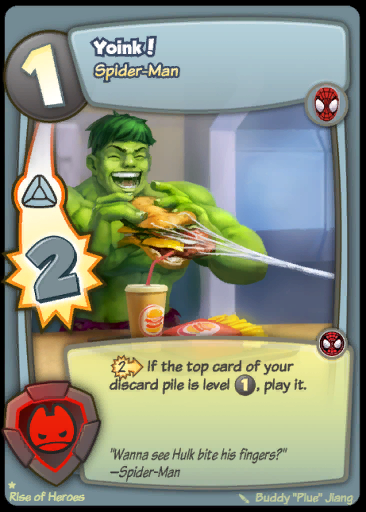 Also, in this game , It can provide a lot of information as to what would be left in your deck and influence your decision as to how and if to block. It promotes having a good memory instead of fussing around endlessly trying to figure out that odds of a block of the appropriate color being flipped. There are teams/affiliations but they only provided bonuses and not restrictions. No card is unplayable in your deck. Just that some of them gain bonuses if certain conditions are met. This is a really nice feature for players who are starting this as their first CCG. It saves them a lot of time deckbuilding. As a general rule, you want to diversify your block symbols. Since there is no ‘stronger’ color of attack, this makes sense. You will have about 6-7 of each block symbol in your deck. This will prevent you from getting totally overwhelmed by your opponent’s attacks and not being able to block/minimize damage. It is generally a good idea to have a kind of ‘curve’ in your deck. This is probably the most important piece of advice for deckbuilding. You generally want to have a lot of your attacks in the meaty part of the curve 3-6 and a few high end attacks as well. Generally you may want to add low cost keepers that will grant your other attacks bonuses. You can only play 1 Attack per turn. When blocking you don’t need to have the Power level of the card. Blocks can be done at all times, regardless of power level. Again, not super obvious at first, but you get used to it. You are not forced to block if you don’t want to. I know it’s kind of an obvious one, but for the younger players this can be important. You need to make decisions in this game and this is probably one of the most important ones. Don’t waste a card to block when you can use it on your turn to do big damage. That about covers most of the game’s concepts. 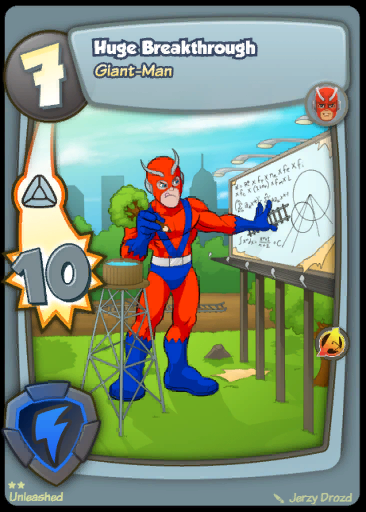 There are cards that increase your Power level temporarily and that decrease your opponent’s as well. This is only a first set, but there are already little mini-themes that give you a heads up on how certain teams/characters play. 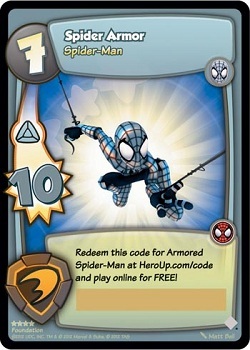 Spider-Man has the Power 1 theme where all his 1 Power cards kind of ‘combo’ together in a string of attacks. 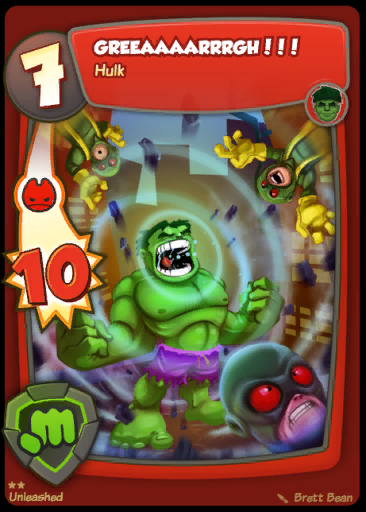 Hulk/She-Hulk gain bonuses from playing with no cards in their hand such as attack boosts and damage resistance. There are also super finisher cards that cost like 12+ power and have insane effects. The likelihood of those getting played in a game is slim unless you can decrease the power they require to play. Oftentimes a 15 damage attack will just get overturned on 3 damage, so the actual number on the damage is not as relevant as one might think. In conclusion, I would like to note that if you are looking for a CCG to get your young ones into and, like myself, you are finding games like Pokemon, Magic and Yu-Gi-Oh! a little too complex for them. 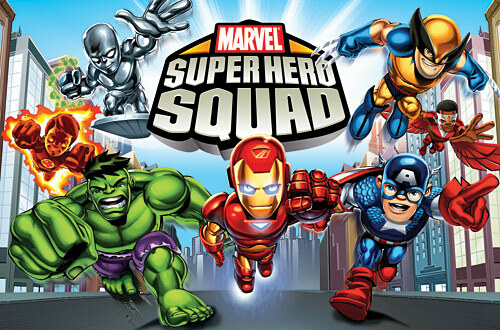 Try this card game on for size! I hear there are Loot cards in certain packs? Yes, there is approximately 1 Loot card per booster box which can be scratched off and used in the Online game, giving you access to some goodies. 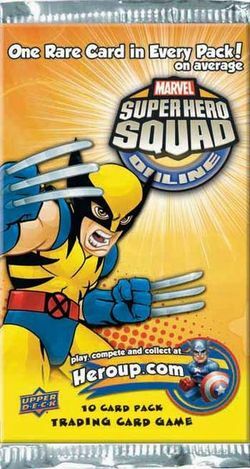 Where can I get some Super Hero Squad TCG Singles? We will be carrying singles for this game as soon as our back end is setup for it. Look for them in the coming month!